Shopping for someone else but not sure what to give them? Give them the gift of choice with Cotswold Koi gift cards. Gift cards are delivered by email and contain instructions to redeem them at checkout or in store. Shopping for someone else but not sure what to give them? Give them the gift of choice with a Cotswold Koi gift card. Gift cards are delivered by email and contain instructions to redeem them at checkout or in store. 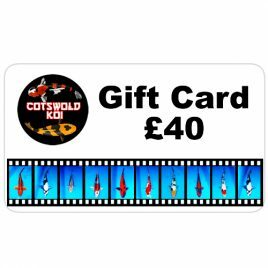 Give them the gift of choice with a Cotswold Koi gift card. Gift cards are delivered by email and contain instructions to redeem them at checkout or in store.